My name is Bruce Brown, it is great to see the farm still working, I lived on Gibson road in the house my parent built (Duane and Joan Brown) for a few years in the late 60's early 70's and worked for Henry picking vegetables for a couple summers. It was hard work but I remember it fondly. 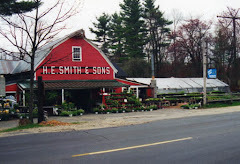 I remember my Dad helping with the remodel of the stand, it was painted red and the name HE Smith and Sons was added.